Beerstraten was the name of two Dutch landscape painters. Anthonie (1639-65) painted mostly snow scenes somewhat similar to those of Hendrick Avercamp; Jan Abrahamsz used more conventional subject matter. Jan Abrahamsz. Beerstraten was a painter and draughtsman. 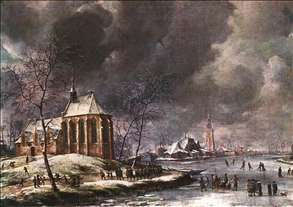 His townscapes were mostly winter scenes, as in the first known topographical painting by him: View of Oude Kerk in the Winter (1659; Amsterdam, Rijksmuseum). Although his work reflects the increased public interest in topography in mid-17th-century Amsterdam, there is also a somewhat romantic atmosphere pervading his winter landscapes. 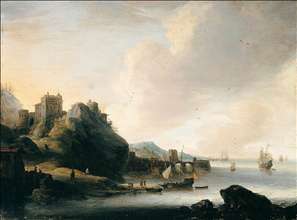 His colours are generally tonal and his style soft by comparison with the clearly defined townscapes by Jan van der Heyden. 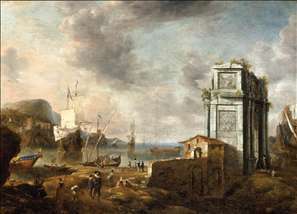 His subjects were also romanticized, as in the Ruins of the Old Town Hall of Amsterdam after the Fire of 7 July 1652 (1653; Amsterdam, Rijksmuseum). Shortly before his death Jan Beerstraten painted the Church of Nieuwkoop (Hamburg, Kunsthalle), depicting the church under a dark, cloudy sky, with a funeral procession emerging from behind it. See more details about "Capriccio of a Mediterranean Harbour"
See more details about "Village of Nieukoop in Winter with Child Funeral"